Bevan House with HOT TUB & FREE Wi Fi Self-cateringBevan House is a 3 bedroomed cottage which is comfortable and well equipped for up to 6 people. It consists of a master bedroom with a zip link king-size bed. A second double room and a third bedroom containing bunk beds. 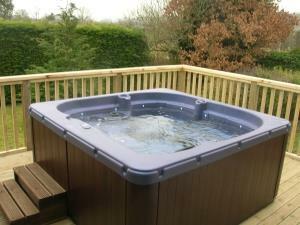 Bevan House with HOT TUB & FREE Wi Fi sometimes limits bookings to 5 or more days. It’s just spot on. Would definitely recommend. Owners we’re handy and I can’t find any fault. That's great, thanks for coming to stay and for the review.